In the single-seat fighter class, the Mustang reigns supreme! 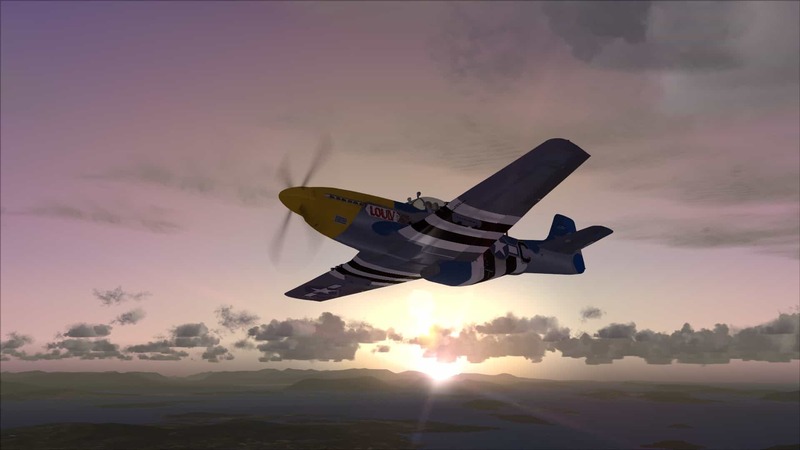 Now you can fly it in FSX: Steam Edition, courtesy of Flight1 Software. Fully selectable weapons and tank load-outs, controlled in-sim via special load-out panel in cockpit. Hydraulic 'bleed-down' for undercarriage doors, controlled from cockpit pressure lever. Removable engine cover reveals detailed authentic Packard Merlin engine with glycol tanks and other details. Removable wing hatches reveal accurately detailed 50 cal machine guns, ammunition belts and loading chutes. Selectable wingspan and range controls on gun sight. Switchable reticule light and animated drop down bulb holder. Removable control stick and throttle quadrant to aid instrument reading and switch functionality. Cold, dark cockpit start possible with all instrument readings to the correct numbers. Accurate starting procedure including correct priming, oiler and boost sequence. War Emergency Power setting on throttle with correct 'wire-gate'. Full hi-fidelity sound-set even includes the characteristic gun-port 'whistle' on fly past. Effects package includes startup exhaust, recognition lights, custom animations from the pilots and more.